- Important update for Facebook users! Fixed yet a new issue with Facebook which wouldn’t allow mimoLive to log into it because the login button was unreachable in the user iinterface. - New: Added a context menu to Media sources to reload, replace and reveal the source file. - Enhancement: PIP Window Layer got a drop shadow option for the bounding box. - Enhancement: Changed some menu item wording and user interface glitches. - Fixed: News Crawl layer didn’t show items in correct order. - Fixed: Opening large documents could make the UI unresponsive for a few seconds. - Fixed: The web browser source wouldn’t show the website when the document was opened and the web browser source was hidden in a collapsed folder. - Fixed: Working with Playlist sources set to a random playback order could have crashed the app. - Fixed: *Important Update for YouTube streamers! * Fixed an issue that causes YouTube to ban mimoLive users for the rest of the day. - Fixed: *Important Update for Facebook streamers! * Fixed an issue on some Facebook accounts which wouldn’t allow mimoLive to log into them. - Fixed: The custom rendering size for certain video sources weren't restored after reopening the mimoLive document. - Fixed: The collapsed state for layer parameter groups weren't restored after reopening the mimoLive document. - Fixed: The used keying mode for Blackmagic Design hardware wasn't displayed correctly in the Playout Output Destination UI. - New: Program Out view can be shown on a Remote Control Surface now. - New: Movie sources got playback controls right in the layer properties. - New: Added a Kiosk Mode in the mimoLive Preferences: Let mimoLive open the Program Out window in fullscreen mode right after loading a document. - New: Facebook live streams will be streaming in secure RTMPS streams. - New: If streaming to a custom RTMP URL mimoLive will attempt to use a secure connection if the URL begins with "rtmps://". Please make sure that your streaming host is capable of RTMPS. - New: The Placer layer got an option to switch between the scaling method "Nearest Neighbour" and "Bilinear Cubic". - Enhancement: The resulting movie duration is now shown correctly if an in- and outpoint has been set. - Enhancement: The Screen Capture frame updates the pixel dimensions display while resizing the frame. - Fixed: Sports Team Data Source didn't work well with the Remote Control Surface. - Fixed: The Layer property "Finder Folder" didn't restore correctly after loading a document. - Fixed: The remaining time of a layer was displayed incorrectly if a assigned movie source had an in- and outpoint set. - Fixed: Screen capture source was eating up too much performance if capturing smaller portions of the screen only. - Fixed: Screen capture source was not restored correctly if the captured secondary monitor was arranged on the right of the main screen. - Fixed: Scrolling Credits layer was counting down the wrong way. - New: Media File Source settings popup allows selection of a playback region as well as previewing movie files and audio files. - New: Added a Zoom In and Zoom Out layer that will Zoom onto a canvas. - Enhancement: Static Text layer and Text Source got an outline option for text rendering. - Enhancement: Lower Third layer: Added a option to pause the background movie at a certain paoint and keep the rest for the outro. - Enhancement: Made the scrolling in the Scrolling Credit layer smooth when changing the scrolling speed while its live. - Enhancement: Warn when copying large media files into the document. - Enhancement: Added an option to the media import dialog to choose a file reference mode. - Enhancement: Added outline option for text rendering in Subtitles, Lower Third and Annotation layer. - Enhancement: Updated NDI® SDK to version 3.8. - Fixed: Sometimes live streaming to YouTube just stopped. - Fixed: Twitter layer will work with Tweet favorites now. - Fixed: Web browser source would sometimes crash or not change window size if custom browser window dimensions were selected. - Fixed: Worked on some more user interface bugs by macOS Mojave. - Fixed: Sometimes YouTube comments were coming in as duplicates. - Fixed: Update the user interface correctly when adding or removing accounts. - Fixed: News Crawler layer didn't want to restart on live if it was told to do so. • New: Media Source now supports a “Play, Pause and Resume” playback mode which allows layers to resume instead of restarting media playback when being switched live again. • New: The user interface for the Screen9 streaming service is now cleaner and offers an option to open the dashboard for additional account or for event management. • Enhancement: Worked on stability and usability of account preferences. • Fixed: Media Sources could suddenly fastforward several seconds if the system performance was under pressure. • Fixed: Some output destinations showed “ready to stream” state even if they were not ready for streaming. The UI no properly reflects this state. • Fixed: Youtube, BoxCast and Screen9 streaming output destinations now show properly if no broadcast or event is selected. • Fixed: When streaming to Facebook the "time left" output was randomly oscillating if no value was provided by Facebook. • Fixed: Add custom actions in remote control surface showed garbage if a layer had multiple variants. - New: Added new streaming service Periscope. - New: Added screen9 streaming service and account for streaming to screen9. - New: Level meters in audio sources are now post-gain and pre-dynamics. - New: Current NDI version is displayed in NDI settings window. - New: Added support for H264 video codec for mimoCall connections. - New: Add advanced settings and statistics to mimoCall Source. 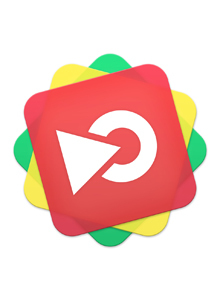 - New: Added an Instant Replay Layer. - New: mimoLive now prevents App Nap, system sleep and display sleep while a document is open. This makes macOS allow mimoLive to stay active regardless of a document's activity. App Nap, for example, would interfere with processing if mimoLive was in the background and no audio output destination was live. - Enhancement: Automatically adjust the channel selection of audio aux output destinations that send audio output to a Bluetooth headset if the headset microphone is activated in an audio source to let active output destinations stay live. - Enhancement: Updated NDI to version 3.7.2. - Enhancement: Output Destinations can now be searched by related keywords. - Enhancement: Add more icons & colors to Remote Control Surface. - Enhancement: Reduced likeliness of intermittent audio input glitches from Blackmagic Design devices. Please note that switching apps or triggering certain UI changes may cause the system to slow down audio data delivery from Blackmagic Design devices for a very short duration which in turn causes audio input glitches in mimoLive. - Enhancement: Increased mimoCall's compatibility with clients. - Enhancement: Added audio fade to Placer layer for dissolve transition. - Enhancement: Twitter Layer: Bring back Favorites. - Fixed: mimoLive was hanging under macOS 10.14.0 Mojave. - Fixed: Fixed a bug in Twitch authentication procedure. - Fixed: Fixed some User Interface glitches in macOS Mojave 10.14. - Fixed: Level meters in audio sources and layers did not respect device delay. - Fixed: The Audio Mix Panel could grow bigger than the screen making some layers unreachable. It now has a maximum height and can be scrolled if necessary. - Fixed: News Crawl Layer didn't work on macOS Mojave 10.14. - Fixed: Playlist source crashed under macOS 10.14 Mojave. - Fixed: Sports Graphics Demo template didn't load properly. - Fixed: Loading a document with 150+ media files failed under macOS 10.14 Mojave. - Fixed: The failsafe source would not be set when the respective menu selection was changed in the NDI output destination while it was already active. - Fixed: Fixed unavailable audio output devices routed to an audio output destination to become “(unavailable) (unavailable) (unavailable)” after several save-load-cycles. - Fixed: When dragging items to a playlist source which was set to Absolute Path reference mode the mouse pointer would incorrectly display a plus instead of a link arrow. - Enhancement: Added more background options to the Scrolling Credits layer including the frozen glass effect. - Enhancement: Loosen the strictness for the streaming protocol in order to be able to communicate with certain streaming services. - Fixed: Web browser source would stop page rendering when it?s browser window was closed for some pages. - Fixed: The app may hang out of the sudden. - Fixed: Keyboard short cuts where totally broken. - Fixed: Controlling the layers an variants selection with the cursor keys was broken. - Fixed: UI glitches under macOS 10.14 Mojave. - Fixed: Crash when quitting the app. - Fixed: Web Browser source didn't show transparency anymore. • New: Added Social Media source: Grabs comments and reactions data from Facebook Live streams or custom post IDs (will be extended for other services soon). • New: Added Facebook Reactions layer: Uses the new Social Media Source as a data source for presenting the Facebook Reactions. • New: Added Social Media Likes layer: Displays likes counts of Facebook pages. • New: Added BoxCast account and streaming service. • New: Added a Matte Choker video filter to adjust the alpha channel of video sources. • New: Added an option to automatically show the Recent Recordings window after a finished file recording. • Enhancement: News Crawler: Added option to restart the content when layer gets switched live again. • Enhancement: The file extension .mp4 commands the File Output Destination to write a native MP4 file. • Enhancement: The New Document window remembers the settings of last document creation. • Fixed: Resetting mimoLives preferences via the Help menu would crash the app. • Fixed: The new Box layer drew the drop shadow at a wrong place. • Fixed: Glitch when movie sources was replayed again: The last frame of movie flashed before the movie played back. • Fixed: Layer level meter does not get cleared when layer is shut off. • Fixed: Remote Controls: Fixed issue that prevented scrolling in layer/sources lists. • Fixed: Remote Controls: Enabled scrolling in action button edit menu. • Fixed: Movie Source: Playback stops when switching previewed layer. • Fixed: UI glitches when working with the layer stack. • Fixed: Streaming output destinations didn't update their video dimensions if the document was changed. • Fixed: Some account data not being saved upon updating. • Fixed: PTZ controls in the Multi View didn't show up reliably. • Fixed: Crash when working with Audio Mix Configurations. • Fixed: New audio mixes beyond the fourth audio mix and some audio mixes in saved documents can not be started. • Fixed: Audio Mix Panel does not update when switching between document windows. • Fixed: Audio click artifacts when muting or unmuting an audio mix via the audio mix panel or the Program button. • Fixed: Layer stays silent despite being live when its content source's audio device or NDI source reconnects. • Fixed: Potentially loud thud when activating the audio output destination or switching the audio device if the device volume is low. • Fixed: Audio output freezes and pitch changes when switching the document sample rate while audio output destinations are live. • Fixed: In some cases removing the web browser source would cause the app to crash. • Fixed: Ducking Trigger source in Audio Only layer now works with Playlist sources and Movies. - New: Assign any audio mix to the output destinations for Live Streaming, File Recording, NDI® Playout, BMD Playout and Audio Aux. - New: Moved audio mix configuration to a separate window. - New: Added a Source Performance Monitor. Useful if there are issues with the video sources. - New: Audio Output Destinations now support downmixing to one physical device output channel. - New: Added a Box layer. - Enhancement: Updated the NDI® framework to version 3.5 and adjusted some UI accordingly. - Enhancement: Made the playout of video sources more stable. - Fixed: Audio channel mapping was not restored when using the system default devices. - Fixed: macOS provided video filters weren't stored in the mimoLive document anymore. - Fixed: Apple AirPods and other Bluetooth enabled headsets with built-in microphone damaged the Audio Output Destination beyond repair if selected simultaneously as output device and input device. A restart of mimoLive was necessary. - Fixed: Streaming to Akamai was broken. - Fixed: Some source types wheren't previewed correctly. - Fixed: Glitch in the Remote Control Surface when using the Flying Text layer: The text wasn't shown properly when the remote was loaded. - Fixed: The Facebook likes layer won't count down if someone removed their “like”. - Fixed: Static Text layer didn't rotate the text with the background box. - Fixed: Leaking memory when using Screen Capture Source or Web Browser Source. • Important: Facebook comments are currently disabled pending a review from Facebook. • New: Sources in the Source Repository are sorted into folders and can be reordered for a better overview. • New: If your audio interface supports multiple channels, you can now select which channels are used for playout in the Audio Output destinations. • New: Sources can be now be removed even if they are assigned in a Layer. • Enhancement: NDI devices are now sorted alphabetically. • Enhancement: Facebook Likes layer shows reactions immediately. • Enhancement: iOS Demo Layer has be updated with iPhone X graphics. • Enhancement: If you specify custom NDI Send Groups to filter for devices, the “Public” group is now included by default. • Enhancement: Undo/Redo now works for sources and other layer parameters. • Fixed: mimoCall client: When switching video sources this caused a freeze of the video feed. • Fixed: NDI sources failed to restore when opening a document immediately after launching mimoLive. • Fixed: Streaming Output destinations did falsely report the encoder being too slow. • Fixed: Working with filters sometimes blocked the app. • Fixed: Crash when working with Layer Settings. • Fixed: Crash when closing a document with a Window Capture Source active. • Fixed: Encoding problem with umlaut characters in the Remote Surface Title.